People who have early memory loss can use a number of techniques to help with remembering things. Below are some tips. Forgetting the name of a person you just met, where you parked your car, where something is that you use every day, or a phone number you have dialed many times before can be unsettling and scary. As you age, it becomes harder for your brain to create a new memory, even while you can remember actions and events from years ago. 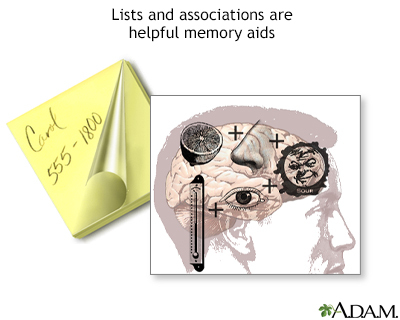 Ways that can help with memory loss are listed below. Allow yourself the time to do the things you need to do, and do not feel rushed or let other people rush you. Have clocks and calendars around the house so that you can stay oriented to time and date. Develop habits and routines that are easy to follow. Read a lot if you have trouble remembering words. Keep a dictionary close by. Take part in enjoyable activities that stimulate the mind, such as word puzzles or board games. This helps keep the nerve cells in the brain active, which is very important as you get older. If you live alone, make an effort to talk with friends and family members. Tell them about your memory problems, so they know how to help. If you enjoy video games, try playing one that challenges the mind. Always place your wallet, keys, and other important items in the same spot. Get rid of extra clutter around your living space. Write a to-do list (or have someone do this for you) and check off items as you do them. Have pictures taken of people you see a lot and label them with their names. Place these by the door or by the phone. Write down your appointments and other activities in a planner book or calendar. Keep it in an obvious place, such as beside your bed. Keep a list of phone numbers and addresses of close family members and friends in your purse or wallet. See if a friend or family member can call and remind you about places you need to go, medicines you need to take, or important things you need to do during the day. Find someone to help you shop, cook, pay your bills, and keep your house clean. Reduce the amount of alcohol you drink. Alcohol can make it hard to remember things. Stay physically active. Try to walk every day for up to 30 minutes and eat a healthy diet. National Institute on Aging website. Forgetfulness: knowing when to ask for help. order.nia.nih.gov/publication/forgetfulness-knowing-when-to-ask-for-help. Updated October 2017. Accessed December 17, 2018. Lists, associations, and repeating the information over and over to oneself are good ways of inabling a person to remember information for later use.